Following 2003's excellent yet under-rated Castlevania: Lament of Innocence on the PS2, Konami is going back to Dracula's lair with the release of Castlevania: Curse of Darkness on PS2 and Xbox later this year. The game will continue the last title's 3D approach, with the challenging gameplay and intuitive controls players have come to expect. However, there will be enhancements with a more elaborate storyline, enhanced RPG elements, and new allied devils adding depth to the game. The lush score, brilliant production values and gorgeous lighting effects should make this the best-looking Castlevania to appear on current generation systems. Read our preview to find out why this Curse should please hard-core fans of the legendary series. While the previous Castlevania adventures have mostly focused on the Belmont Family's eternal battle against Dracula, Curse of Darkness introduces an entirely new protagonist, Hector who worked as a Devil Forgemaster under Dracula himself, refining his skills as they years went by. As Hector slaved under Dracula's command, he became disillusioned by his master's ideals and fled Dracula's castle Vallachia. Determined to live a more normal life, he left Dracula vulnerable to the attacking Belmont clan. Once the evil Dracula was defeated by the Belmonts, a curse was released after three years had passed. This curse was released upon Dracula's death and infected Europe with plagues of perstilence, heresy and violence. Amongst this chaos, one of Hector's old friends, Isaac suddenly appears. A fellow Devil Forgemaster, Isaac blames Hector for Dracula's defeat and seeks revenge. Isaac sets up Hector's wife and she perishes after being executed during a deadly witch trial. Angry and seeking revenge, Hector sets off to return to his former home of Vallachia to seek Hector. However, the old castle has now been completely subsumed and morphed by dark magic and is filled with terrifying creatures and monsters who are alligned with Dracula's evil spirit. After several awkward attempts at bringing the series into 3D, Konami finally succeeded two years ago with the release of Lament of Innocence on the PS2. It was a solid game that faithfully brought the atmospherics of 2D classics like Symphony of the Night (PS1) and Circle of the Moon (GBA) to 3D while offering solid 3D play mechanics that didn't intrude on the action. Now, the upcoming Curse of Darkness looks to bring the new series even further along, with a higher degree of polish, improved play mechanics and a deeper storyline. One of the main criticisms leveled at Lament of Innocence was the fact that the game emphasized action at the expense of character building. The developers have listed to these complaints and are promising a much deeper character development system. Hector will you gain new powers as you earn Experience points. This should players to build up their character's powers as they progress through the game. Hector will have a number of different weapons, and can use the game's elaborate combo attack system to slice and whip through enemies. 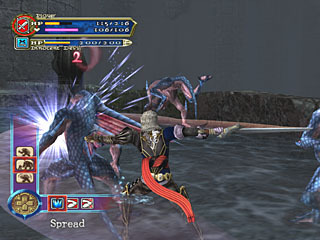 One of the more interesting aspects of the game's system is the player's ability to develop allies out of enemies, which are called Innocent Devils. Once these have been created, players can use these new allies to help them evade traps, solve puzzles and defeat enemies. You can also enhance the Innocent Devils as they go along with new skills and abilities. 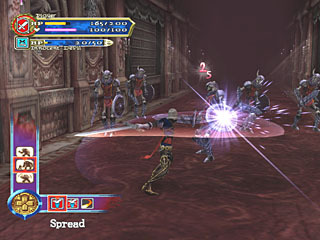 In addition to battling standard foes, players will also face a number of hidden areas and traps as well, which should increase the challenge. The game's level design is promising to be much more refined than the last game, though hopefully the maps will remain straightforward and easy to navigate through. The main adventure will be quite challenging and will feature many hidden areas which should make for quite an experience on its own. Curse of Darkness will also feature an increased number of unlockable elements. This should increase the game's replayability and longevity, addressing the last game's short length. 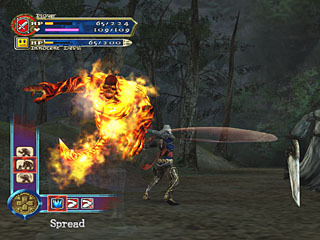 During his quest for revenge, Hector will face a variety of boss creatures during their adventure, including the Mintotaur. He can attack these foes alone using his standard moves and attacks to defeat them in epic battles. However, he can also use one of their Innocent Devils to assist them during these confrontations, which will further enhance Castlevania's RPG-like feel and adding a layer of strategy to the gameplay. In fact, players will find both the character's standard hearts and their HP displayed onscreen, which should make tracking their progress much easier. Players will also be able to select from a variety of weapons and spells using the d-pad, which should further enhance the role-playing aspect. However, action fans shouldn't worry, since Curse of Darkness will have plenty of classic Castlevania action and adventure, with plenty of whipping to please everyone. 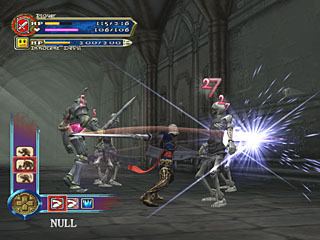 These added RPG elements look to increase the depth, giving players access to additional moves, spells and powers, allowing for a much deeper gameplay experience than the last PS2 game offered. 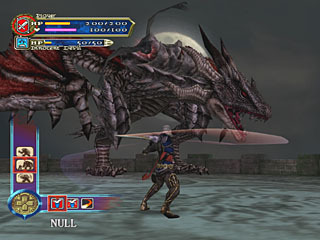 One of the key aspects of the series' longstanding appeal amongst gamers has been its rich aesthetics, and Curse of Darkness looks to carry on the Castlevania tradition. Players will find beautifully rendered environments, with elaborate light sourcing, brilliantly designed creatures and smooth animation. The third-person perspective worked well in the last game, and this one looks to feature a more dynamic camera system and increased cinematics to give the game a much more dramatic feel. The game's production values should give Castlevania the beautiful, gothic appearance players have come to expect. Castlevania games have always featured memorable soundtracks. These compositions include some of the most evocative scores in gaming, going back to Symphony of the Night and even the NES classics. With Aria of Sorrow's legendary composer Michiru Yamane on board, there should be little doubt that the game will most likely sound as great as it looks. With this in mind, Curse of Darkness should be an audio-visual treat the further solidifies Castlevania's legacy as one of the best series for all time in the hearts and minds of gamers. While many expressed doubts that the series could actually work in 3D, Lament of Innocent quelled these worries by offering solid gameplay in beautiful, evocative environments. Now it looks like Konami will offer many refinements to the formula, including deeper RPG elements, new allied characters and more satisfying gameplay with a deeper storyline and more elaborate plot. With so much work going into it, it seems that all the elements are in place to make Castlevania: Curse of Darkness one of the best titles in the series to date. With PS2 owners salivating for more, and Xbox owners anticipating the series' debut on the console, this should be one of the fall's most enjoyable titles.